What it lacks in size, it more than makes up for in content. The Peleg Sprague Papers have been cataloged and are now open to the public. The collection consists of correspondence from some of the most important “movers and shakers” of antebellum America – Henry Clay, Daniel Webster, Edward Everett and Rufus Choate. Also included is a remarkable letter written by a very young Henry Wadsorth Longfellow while he was a student at Bowdoin College. Peleg Sprague (April 27, 1793 – October 13, 1880) was an American politician and U.S. Federal judge. He was born in Duxbury, MA to Seth Sprague and Deborah Sampson. After graduating from Harvard in 1812, Sprague studied law in Conneticut and was admitted to the bar. He practiced law in Maine before becoming involved in politics. Sprague served in the Maine House of Representatives from 1821-1822. In 1823 he was elected to the U.S. House of Representatives from Maine’s Fourth Congressional District (1824-1829). He then was elected to the U.S. Senate (1829-1835). 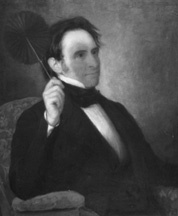 In 1835 he resigned from the Senate and practiced law in Boston from 1836-1841. In 1840 he was a presidential elector for the Whig party. In 1841 Sprague became a Judge for the United States District Court for the District of Massachusetts. Due to his failing eyesight, he retired from the bench in 1865. Peleg Sprague married Sarah Deming in 1818. Together they had four children: Charles, Seth, Sarah, and Francis. He died in Boston in 1880 and is buried in Mount Auburn Cemetery, Cambridge, MA. For a complete item list of the Collection, click on the Peleg Sprague Papers in the menu bar on the right.